Graceville Public Library | NEW IN AT GRACEVILLE! BLOCKS ROCK! NEW IN AT GRACEVILLE! 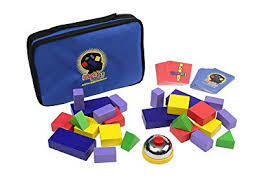 BLOCKS ROCK! Kids, bring your friends in after school with you and play this fun new game and race to see who can build their blocks up the fastest! You will have an even amount of blocks to work with, and a bell is centered between the players. Players take turns flipping over cards. The players then build up the blocks to match the picture on the card. But its more than just that. The blocks should be touching to consist of a successful build. Once the blocks are built then the player who finishes the structure hits the bell and wins the round. If the structure isn’t accurate, the game will continue, and either player has the option to keep building or ring the bell. The player who wins the round keeps the card. At the end of the game, each player adds up his/her cards at the higher total wins. « THE LIBRARY WILL BE CLOSED THIS SATURDAY, DEC. 1ST!